Not Pudding. Me. It may be a bit of a cliche but Pudding definitely teaches me things. He is so friendly with everyone he meets, welcoming them with an open heart and no judgement, despite often being on the receiving end of judgemental looks himself. To him, everyone is a potential playmate regardless of age, race, class or any of the other constructs that we use to measure each other against. 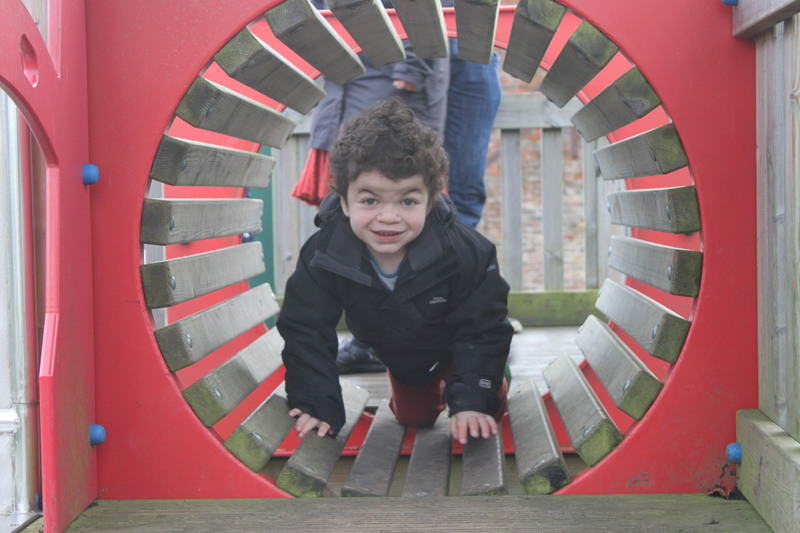 Today I took the boys to the playground after ERT – time to get some fresh air after all the medical stuff. When we arrived there were some older girls hanging around so I avoided them and started playing tag with T whilst also trying to make sure Pudding didn’t escape. But within 5 minutes Pudding had zoned in on the others and moved in closer. I could hear laughter coming from the girls and my Mummy-radar was on high alert. Were they laughing at him or with him? It’s so hard to tell sometimes but I’m getting better at giving strangers the benefit of the doubt. Rather than marching in with suspicious looks, I used some Makaton to him (signalling to them that he is different) and translated what he was saying (‘Found you!’). I then backed off though I desperately wanted to stay and protect him from their potential scorn. Two minutes later he was having the time of his life with four girls chasing him round the playground whilst they shouted ‘Found you!’, and making him screech with laughter. I was free to sit down and take it easy, smiling at their acceptance of the simple level of play he was capable of. When they left he cried. And when they came back again a few minutes later they loved his shout of joy. Pudding’s approach might not always work, but it certainly has more chance of winning hearts than approaching others with suspicion. I’m not sure I’m capable of just walking up to strangers to point at them and shout ‘Found you!’ but his smile is one thing I can learn from and his belief in the kindness of others. Though I definitely can’t carry it off with quite such cuteness! I don’t know what to write. I feel…a bit blank. We’re in limbo land again. Waiting for news on a surgery date *. Waiting for news on the NICE/NHS England decision. And in the meantime, even in a world where I am used to seeing dead or dying children on my Facebook feed, it has been an out of the ordinary week. Seven MPS children have passed away in one week. Seven families are now looking at an empty space where their beloved child was. I didn’t know any of the families personally – most were living with MPS III, so I didn’t have as much contact with them – yet I have seen photos of some since my early days on the Facebook group. Each death hits our community hard and they will be mourned around the world. There are still families fighting on though. Families who need the hope of a cure and the knowledge that future treatments will help their precious children. The government’s own Rare Disease Strategy, published in 2013 states it should “ensure no one gets left behind just because they have a rare disease”. This is one thing I believe they could get right. If you haven’t already, please consider signing this petition to help it happen. * We did get some slightly better news about Pudding’s clinical trial. Last week I was concerned that we had had ten months of wasted blood tests, hospital trips, and so on. Ten months of normal life being interrupted by medical stuff that we have forced him to submit to. However, having checked his CT scans the neurosurgeon confirms that although the portacath is now in the wrong place he believes that Pudding will still have been receiving at least some of the dose in a roundabout way. He won’t be given another dose though until the portacath has been revised.